Blue_Plastic_Action_Case_Envelopes is rated 5.0 out of 5 by 1. Rated 5 out of 5 by OSCor from Just what I was looking for so long I wish I had found it sooner and everyone agreed on it. 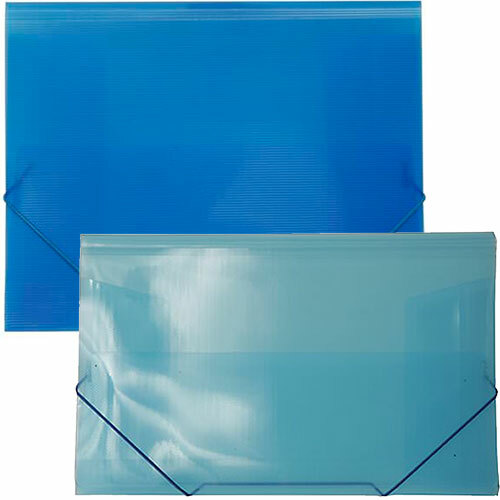 For a cool, calm and collected looking portfolio, turn to our Blue Plastic Action Case Envelopes. Made of long lasting plastic, these cases can smoothly carry any project or presentation. Blue Action Cases feature a sleek elastic closure at the bottom, this way and all papers will stay put. Simply tuck your portfolio under your arm, walk the halls (whether at school or the office) and turn some heads. Plastic Action Cases come in all different shades of blue! This way you can choose from light (for a serene and calming look) to dark (for a professional look). Either way, you're sure to make the statement you're looking for. Love the Action Case but want a different color? Check under 'Other JAM'n Products You Might Like' for an awesome assortment!